Woman's wedding ring with raised gold and silver 'pebble' design on exterior. 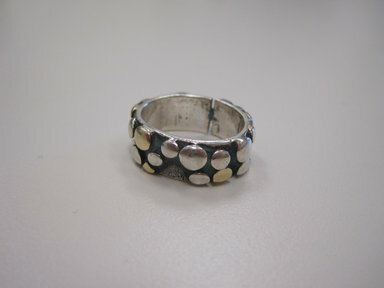 Small wedding band with join at reverse, exterior with irregular shaped large and small 'pebbles' in polished silver and gold against a dark matt background. Some 'pebbles' appear to be missing and band join has separated.